As I mentioned in my last post, when I travel I invariably have a list of items to purchase from said destination. And so here were the things which I brought back to dear old Blighty and considered innately Italian. Something I picked up on during my visit to Rome last January was the fact that Italians are just as aware of the short comings of classic Blake stitched shoes during winter as Englishmen. To compensate they’ve developed elegant footwear hardened for winter use. While the English do Dainite soled shoes they can be a bit bulky. So my trip seemed an ideal time to pick up some elegant Italian winter footwear. 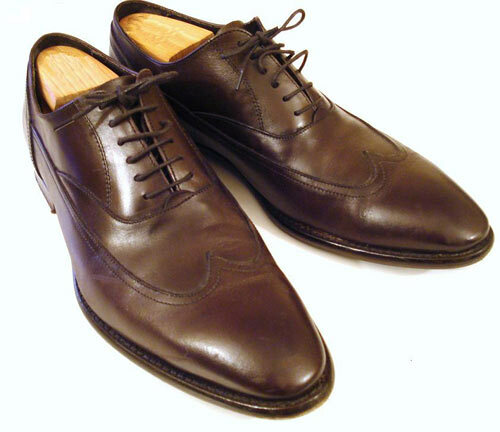 These long wing oxfords have double thickness leather soles with rubber overlay, which still makes them less bulky than Goodyear Welted shoes. In my experience the English will frequently forgo practicality in favour of tradition and the maintenance of basic good form. The Italians, however, suffer no such hang-ups, often combining the classically inspired with modern practicality to great effect. Italian footwear tends to come up on the smallish side. While the last is long and a little narrower than I’m used to they are nevertheless comfortable, supple and better suited to withstanding wet winter pavements than my English leather soled footwear. These were from inexpensive family firm Otisopse, based in Florence. I don’t know enough about Italian shoe brands to risk spending too much. But, I figured at €90 they were comparable to entry level Loakes – which are perfectly good shoes. The English don’t really do brown shoes with navy suits, although we’re getting better. So here was an inexpensive opportunity to add some winter-proofed Italian styling cues to my very English wardrobe. If you go to Florence then as far as purchases go gloves are a must. The most famous, amongst the many local retailers, is Martelli. This family firm actually make their own gloves (handmade) in their own workshop in the area itself. The prices are noticeably cheaper for a markedly superior product than one would find even in the UK. 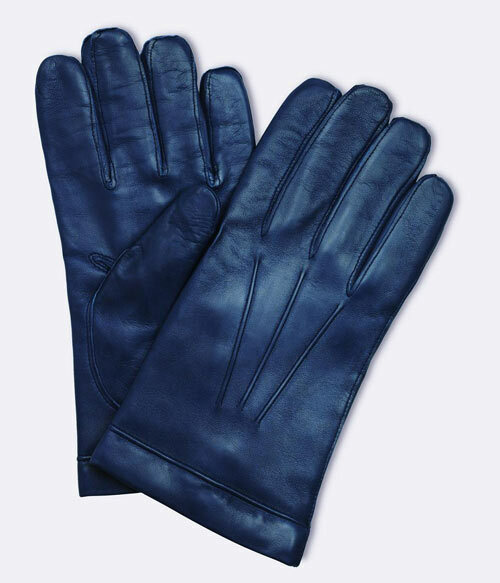 These particular gloves are Navy leather with a soft cashmere lining and cost me just 39 Euros (about £35). The shop assistants fit the gloves on you and the range of colours and leathers available is bewildering. As a rule a man can do little wrong if he matches his gloves to his shoes: brown with brown, black with black and deerskin with chestnut. As your confidence with colour matching grows you can consider branching out. As it happens I have a pair of navy tassel loafers so these will fit nicely. But I’m considering buying a fawn Covert Coat this season which will invariably be paired with navy suits and navy scarf. So while navy is an unusual choice I’m hoping it will work rather well with other items in my wardrobe. A country famed for its ties, they were the first thing on my list when I’d decided upon Italy for a winter getaway. 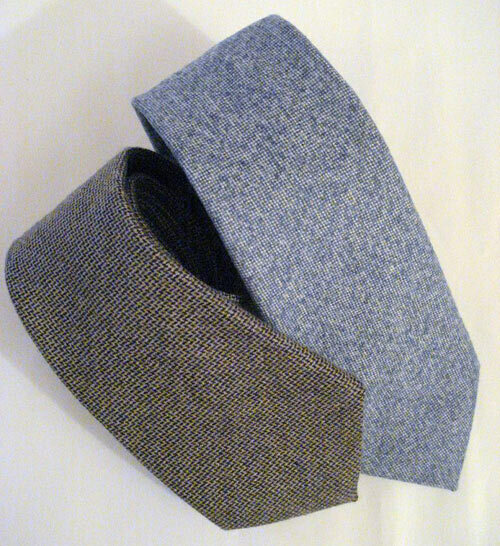 In particular wool and cashmere ties were the goal. The must have accessories for this year’s autumn and winter, I figured I’d get both at a cheaper price and in greater variety thanks to the country’s preponderance of cashmere and wool manufacturers. Although there was a wonderful array of cashmere ties available at an average of €120 they were still a bit beyond what I consider reasonable for a tie. Wool ties were plentiful and at a more reasonable €50-€80 a pop. The quality was better than those I’d found in London as was the price. These two I bought from Boggi and a little independent store called Derby. Wool and cashmere ties add texture to worsted suits which combined with the natural matt finish provides sombre solidity ideal for winter months. The solidity and sense of richness that comes from wool and cashmere also adds luxuriousness, although that comes out best when the tie is mottled or woven with a pattern, as above. I’m hoping the brown one will better enable me to integrate those brown shoes into my wardrobe. So far it has. I am a big fan of yours but I beg you to fix the apostrophes. Italian’s? Oh dear. Fun choices – would have liked to be in your (blue?) shoes. Nice pair of austerity brogues.